Super Flower announced a new line of Leadex 1600W series power supplies available with 80Plus Gold, Platinum and Titanium certification. Pricing is 269.90EUR, 299.90EUR and 349.90EUR, respectively at Caseking. Being first to market, Caseking have the first 1600W power supplies listed from the multi-award winning Super Flower, featuring the latest "Titanium" and "Platinum" Rated efficiency, bringing a new standard to power supplies. 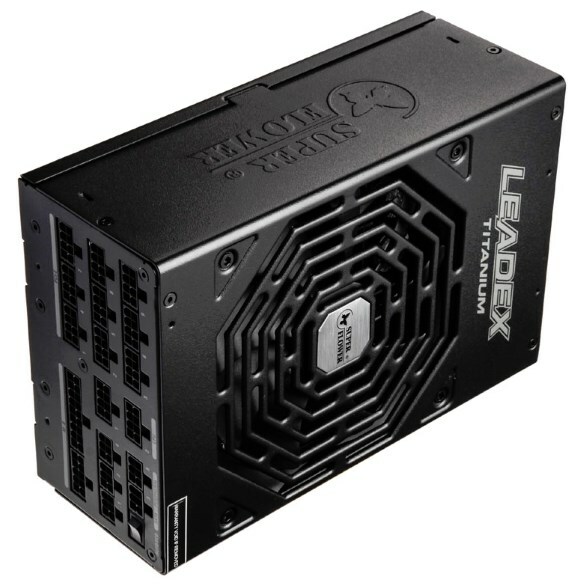 Super Flower, one of the worlds leading power supply manufacturers have added the Leadex 1600W to their range, offering up to 94% efficiency with class leading features, as well as offering a huge 1600W capacity, one of the highest wattage with multiple certifications in the market.. The Super Flower Leadex 1600W Power Supply features a fully modular design, 140mm silent DBB Fan, full Japanese 105°C capacitors, ECO Intelligent Thermal control system, a huge amount of connectors and single rail design. The 1600W comes in the Titanium, Platinum and Gold certification. As always with the Leadex models, the power supplies are fully modular for easy cable management, and so you don't use more cables than you need to. The connectors include the popular patented Install Crystal Clear Cube Connectors with LED. Super Flower power supplies are perfect for gamers and enthusiasts and now with the higher wattage seamlessly powering high performance graphics cards in SLI / CrossFire without breaking a sweat. SuperFlower Leadex Titanium 1600W Fully Modular "80 Plus Titanium"
SuperFlower Leadex Platinum 1600W Fully Modular "80 Plus Platinum"
SuperFlower Leadex Gold 1600W Fully Modular "80 Plus Gold"